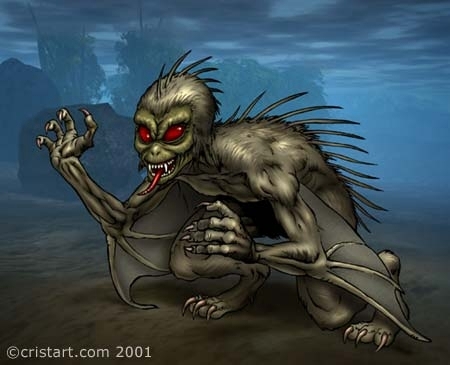 One of the most well known cases of a supernatural creature is that of the Mothman. In the small town of Point Pleasant, West Virginia, there were over a hundred sightings of this creature in a little over a year, yet it had seemingly never been heard of before or since. New research has revealed that there is a strong possibility that this assumption was incorrect and that the Mothman did not simply disappear. "It is a happy man who is loved and liked by everyone..."
..it certainly did'nt forewarn of any catastrophies. How did they draw similarities??? go to this SPOOKY LINKY to see supposed pictures of the Vampire before and after it was 'exorcised' - WARNING could be unpleasant for the easily spooked. Can you handle the truth if you find it? If you die in the matrix you die here? Animal-X is preety good but they never even try to make the creatures real looking, it's always a dude in a suit or a cheesy animation. I just thought I would say that. Loves these stories like this I just love to hear about anything having to do with Cryptozoology! in brazil under the assumed identity "chupacabra"
maybe we shoulda been watchin for something to happen there? Most people can hear; however, how many really listen? Same creature, different names. Would be interesting to know if these are connected.